飛行種籽 Soaring Eagle: Wave：What do we hear? What do we see? Waves are defined as a disturbance or variation that transfers energy from one point to another. Wave can be classified as mechanical (e.g. sound) or electromagnetic (e.g. light and radio waves). 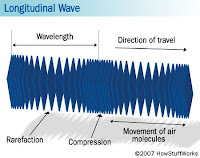 The two main types of waves are transverse and longitudinal. In a transverse wave, the particle displacement is perpendicular to the direction of wave propagation. These waves may occur on a string, on the surface of a liquid, and throughout a solid. The particles do not move along with the wave, they simply vibrate up and down about their equilibrium positions as the wave passes. Light is electromagnetic (em) radiation that comes to our eyes in the form of a transverse wave. The human eye can see radiation of wavelength between about 380~750nm. EM transverse waves are a special case in that they are classified as transverse waves even though no particles vibrate. Light has the properties of both waves and particles (photons). After a long scientific argument about whether light is a particle or a wave, scientists agreed that this property referred to wave-particle duality, which is the concept that the matter and energy exhibits wave and particle like properties. Longitudinal waves are waves that have vibrations along, or parallel to the direction of motion. Particles of the medium vibrate forward and backwards, along the direction of travel which result in wave propagation. Sound is a form of energy transfer. The sound is brought to our ears by particle vibration in the form of longitudinal waves. 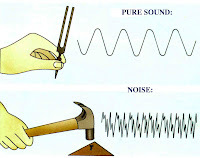 The volume of sound waves is controlled by the amplitude. Pitch is controlled by frequency, and the timbre is controlled by the shape of the waves. See Wikipedia contributors, Wikipedia, http://www.wikipedia.org/ (as of Mar. 19, 2009). See 29 HowStuffWorks, HowStuffWorks "Wave Basics", http://science.howstuffworks.com/doppler-effect1.htm (as of Mar. 19, 2009). See Dan Russell, Longitudinal and Transverse Wave Motion , http://www.kettering.edu/~drussell/Demos/waves/wavemotion.html (as of Mar. 19, 2009). See Array, (GIF Image, x pixels), http://mmem.spschools.org/grade3science/3.sound/musicnoise.jpeg (as of May. 16, 2009). See Giangrandi.ch, Visible spectrum, http://www.giangrandi.ch/optics/spectrum/spectrum.shtml (as of May. 16, 2009).